Season 2, Round 2 of the Arcadia 2001/MPT-03 High Score Club will last about two weeks. This round ends on Sunday, February 4, 2017 at 10pm MST (aka Monday, 2am GMT). 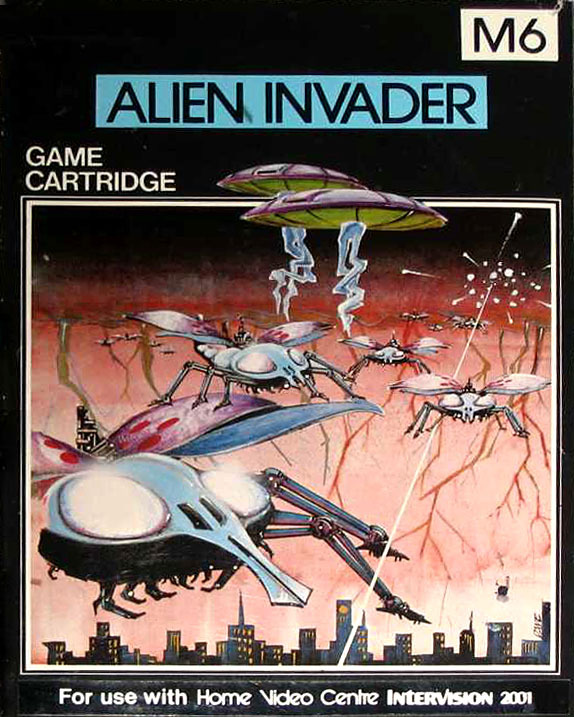 The game being played this round is Alien Invaders, a game released in 1982 for the Emerson Arcadia 2001. 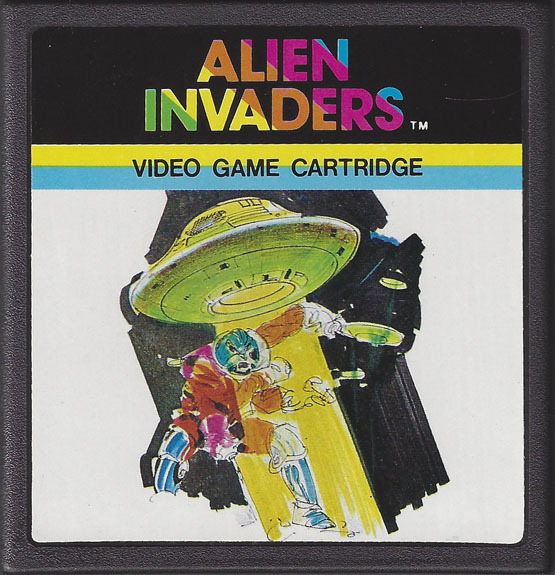 Alien Invaders is based on Taito's 1978 space-themed arcade game Space Invaders (released in America by Midway). For such a very simple game, there really is a huge amount of information in this post. You don't need to read it all (just pick up the controller and start firing-away at the baddies! ), but if you're interested in the game's history, then you'll enjoy this post. Seventy space invaders are fast on their way towards your city, and you can be sure they're not dropping in for afternoon tea! You have just five minutes of accelerated computer time to blast the nasties and save your city from certain destruction. There are three fortresses, behind which your missiles are safe. But watch out! These invaders are smart! If you hide there too long, they'll bombard the castle walls, so keep moving around or the evil space critters will get you, and we wouldn't wish that on anyone! Here is a video with gameplay of Alien Invaders uploaded to YouTube by "GuiasInfojuegos" on March 3, 2013. The sound in this video seems a little different from what I hear on my NTSC system. Maybe because it's being played on a PAL console? 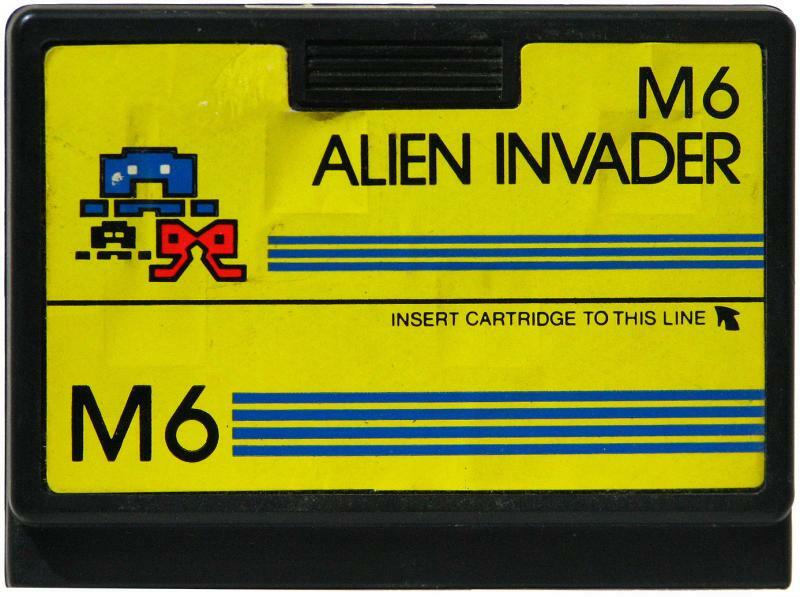 The American release of Alien Invaders has no keypad overlays. Yup, you guessed right! This artwork is just plain weird! I guess no Emerson Arcadia artwork should surprise me by now. At least this art doesn't appear to resemble a Millennium Falcon. Hey, Arcadia Graphic Artist! Can you hear me? I want to interview you! 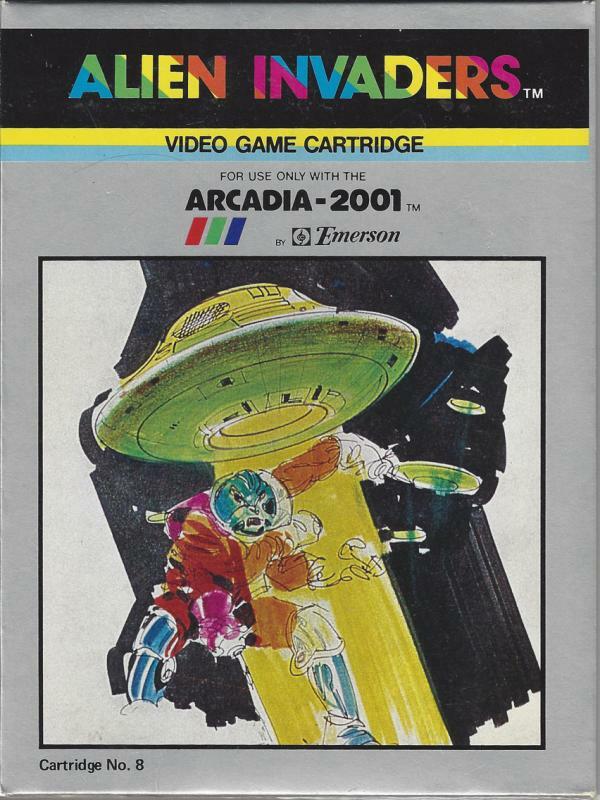 I haven't really looked much into the non-American releases of Arcadia games for the Arcadia HSC, but I was curious if any of the games have better artwork-- and some of them surely do. The following pictures of boxes and cartridges all come from James Jacob's website, Emerson Arcadia 2001 Central ( This website supports all of the Signetics 2650-based machines (Interton VC 4000, Elektor TV Games Computer, et al.). 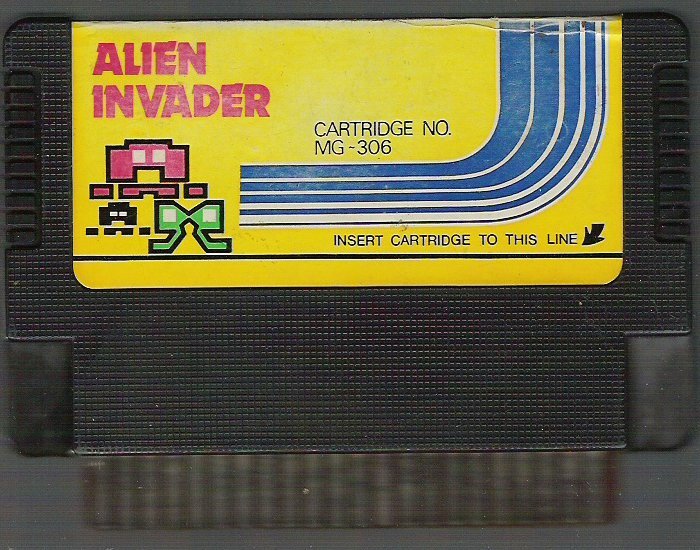 Play Alien Invaders on real hardware (PAL, NTSC, and any Arcadia family systems) or use the WinArcadia or MAME emulator. There are no gameplay options for this game. Just press the Start button and begin playing. Every game lasts about three minutes, no matter how many lives you have left. We're playing for highest score. I'm using Ward Shrake's "Director's Cut" of his Arcadia 2001 section of the Digital Press Collector's Guide 7 (published in August 2002) for most of the information that is in this section. I'm including Ward's information about Alien Invaders on two difference systems, the Emerson Arcadia 2001, and the Bandai Arcadia. Alien Invaders is also known by at least four other names: Alien, Alien Invader, Invasion aus dem Weltall, and Les envahisseurs étrangers. 4k cart. 1981. #1003 (Cart #8 ). Short case. One player game; uses left side controller. Unauthorized clone of the coin-op arcade game "Space Invaders". 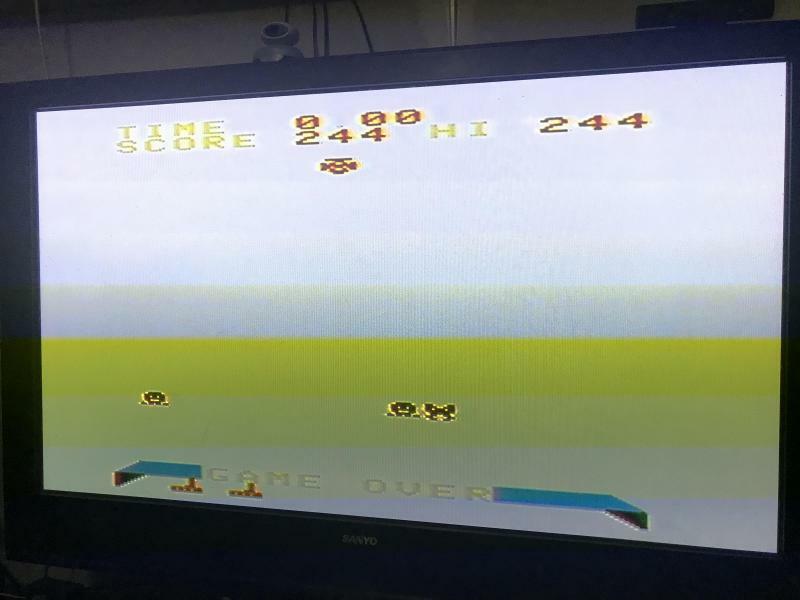 One of the earliest games and it shows. Not a game to impress potential new console fans with! 4k. Bandai #3. One player game; uses left side controller. Short cartridge. Clone of the "Space Invaders" coin-op. Manufacturing codes found printed on masked ROMs made by Signetics show this is one of the earliest carts written for the console. Without much effort, we researchers found carts dated "8103" and "8108"… in other words, weeks 3 and 8 of 1981. To put that in perspective, realize that Emerson said in an official U.S. trademark application that their first use of the console name was in March of 1982; 15 months later. Even so, the program's history goes back even farther, in some form. 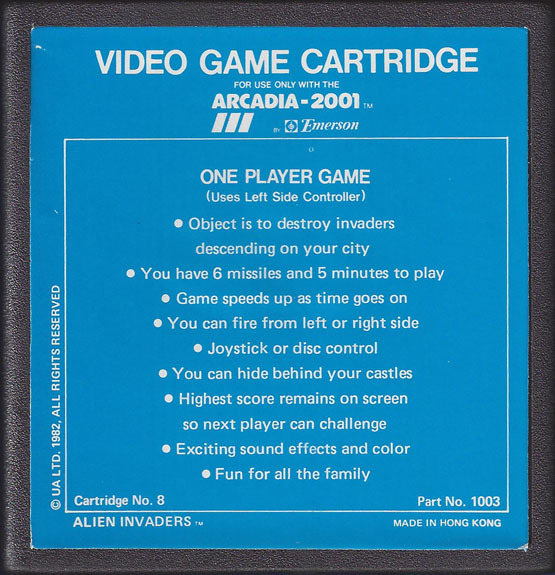 Back in the days of the Arcadia 2001's "prequel" console -- the "Interton VC-4000" and its clones -- Signetics had released assembly code listings of a short "Space Invaders" game, to show consumers how to write programs for that console. This Arcadia program is likely a ported and updated version of that much-earlier Interton game. It is very interesting historically because of all that, but from the point of view of a potential new console buyer during 1982, this game and others like it most likely hurt potential console sales, big time! 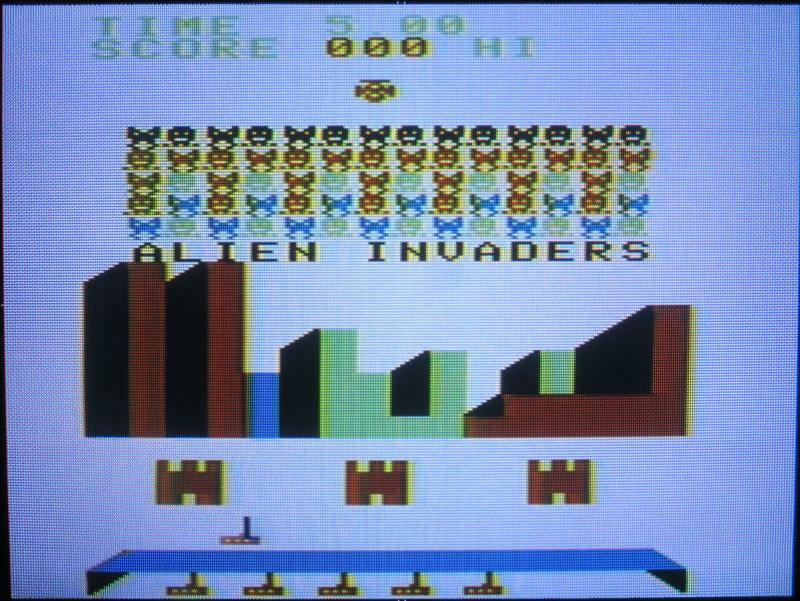 The graphics looked awfully simple when compared to next generation machine's games, even though they were not bad compared to many earlier contemporary clones of the "Space Invaders" genre. 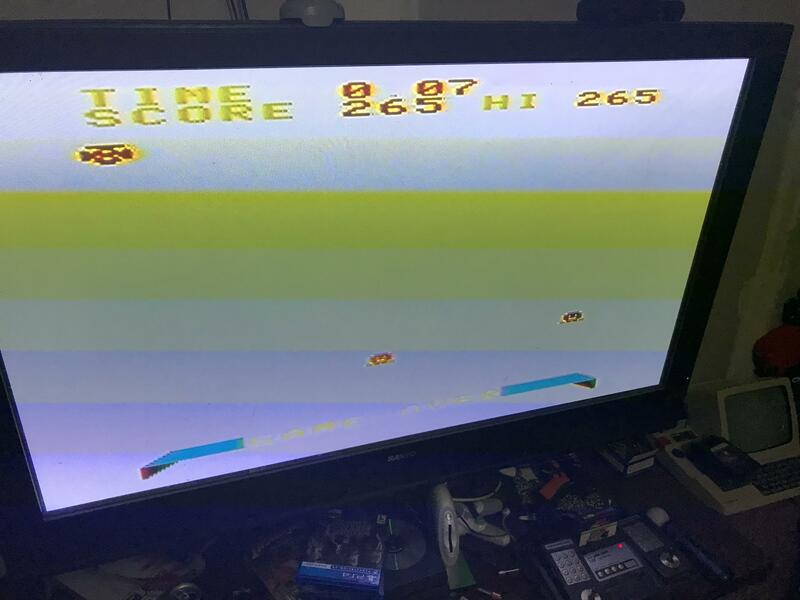 I may go so far as to say it had the same effect on people that the Atari 2600 version of "Pac-Man" often had… to make a potential console buyer think that, "if this is the best this console can do, then I do not want to buy it." Most people had seen various better versions of the game. The white background was off-putting and not visually appealing. Sluggish game play did not help matters much. Later games proved this was NOT all the console could do, but in some markets, buyers saw the new machine show up in stores briefly, then disappear into bargain-bin and closeout sale obscurity alongside machines like the Timex Sinclair. Having seen games like this, most modern collectors figured they knew why. 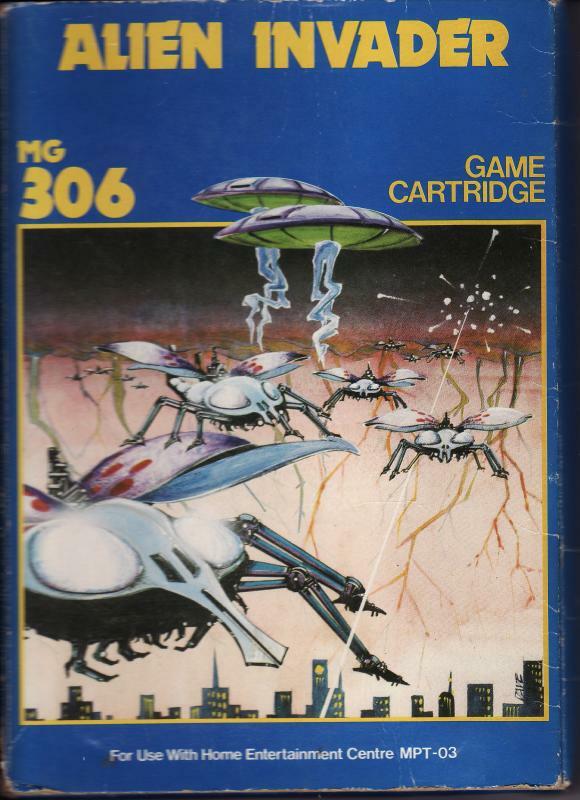 A handful of modern collectors saw the later games and liked them, but until 1999 or so no one knew for sure that games on MPT-03 consoles were ROM-compatible with Arcadia machines. Anyway, we can only hope that retro-gamers figure out good games can be done on this console, despite the impression of games like this. 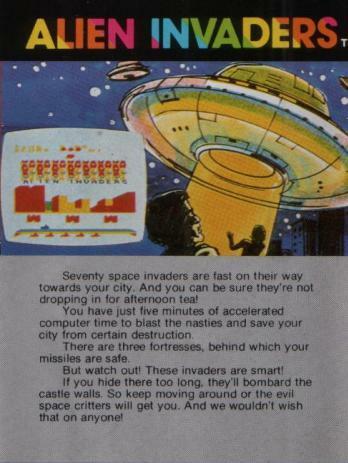 Your city and 6 missile launchers are under attack by 70 "invaders" who were launched by their "MOTHER SHIPS." The object of the game is to shoot down ALL THE INVADERS & THE MOTHER SHIPS before they destroy your missile launchers. You have 5 minutes of accellerated computer time showing (actual time is approx. 3 minutes) to accomplish this task. 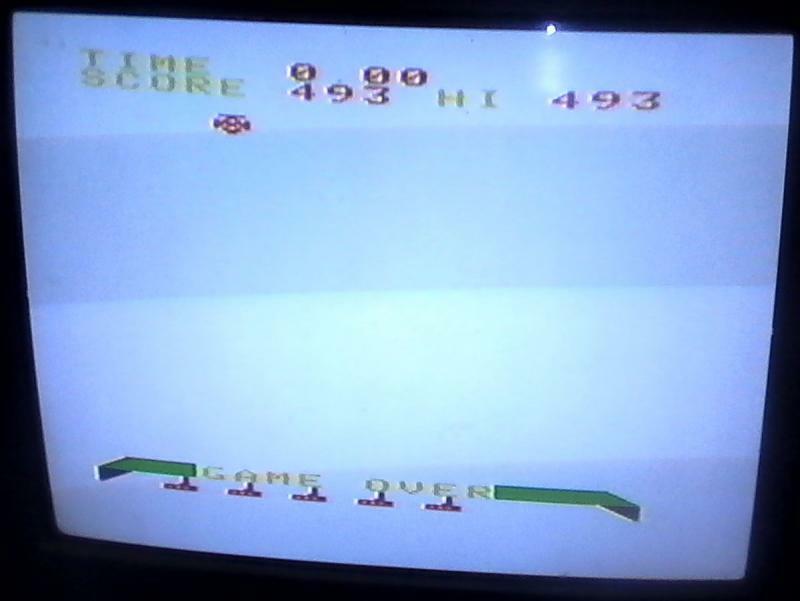 At the end of the game your score will appear at the top of the screen. It will remain in the computer memory as "HI" score until someone "beats" it. The next Higher Score will automatically replace it. This game can be played by as many consecutive players as desired. The "HI" score will remain on display as long as each successive game is triggered by the "START" button if power has not been turned "OFF." 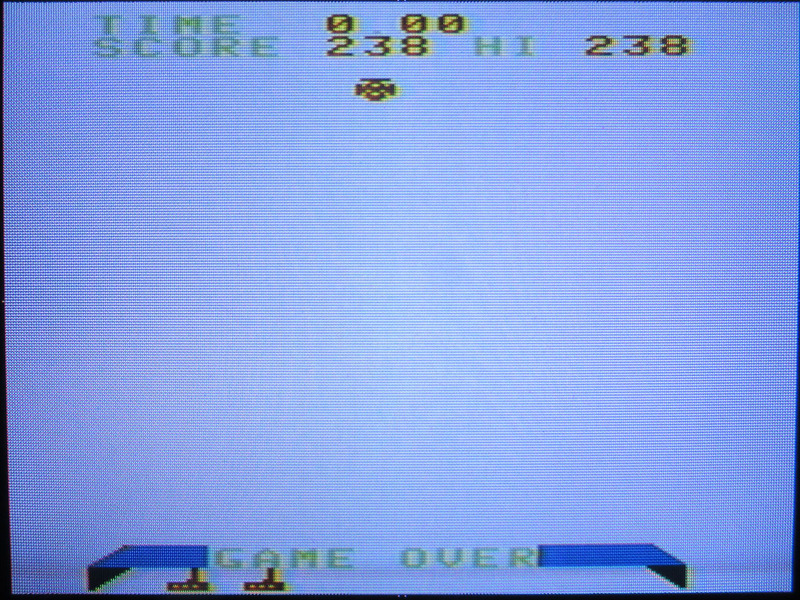 IN ORDER TO "ERASE" the HI-score you can either push the "POWER" button or push the GAME RESET BUTTON. You will hear musical notes and first see the MISSILE LAUNCHERS, THE CITY and THE DEFENSIVE CASTLES, in red, yellow, green and black colors. You will also see time 5.00 and 000 HI. Slowly the mother ship will appear below "000" and you will see the "INVADERS" being launched by the mother ship. The game is ready for ACTION. Since this is a "ONE PLAYER AT A TIME" game, the Left Hand Controller will be used. Pick up left hand controller with "Disc" towards you. The controller has 4 functions. Stop the missile launcher — release Disc. Fire missile - Depress side button (either one) or press digit #2. 1. The invaders will start moving and shooting at the missile launchers. 2. Press "Disc" for evasive action. The missile launchers can move left or right. You have 3 fortresses behind which your missiles are "safe". However, the invaders can penetrate your "FORTRESS" cover one block at a time. You can also shoot thru the fortress at the invaders. Every time your missile hits the fortress it also destroys 1 protective block. You will see on the screen a black missile on top of launcher. To shoot, squeeze either Action Switches or press # 2 on keyboard. After each missile is launched the next missile will be loaded and ready to fire. You will notice that as the invaders descend on the city- the buildings will shrink accordingly. As you hide your missiles behind their defensive castles the invaders will seek out that particular castle and "bomebard" it. So keep your missile launcher on the move. If you merely try to hide behind the "castle", the invaders will "get you". At the end of the 5 minutes, for each missile launcher you have left you receive an additional 10 points per launcher. At the end of the game your score will show. If it is the highest score, then it will also appear next to "HI." The HI score for the competition can only be removed if the RESET button is depressed or the power is turned off. 1. Invaders will move faster and will start descending as time goes on. 2. The game ends when all missile launchers have been destroyed or the time runs out. If you wish to retain the HI-score then merely depress the "START" Button. Then continue. 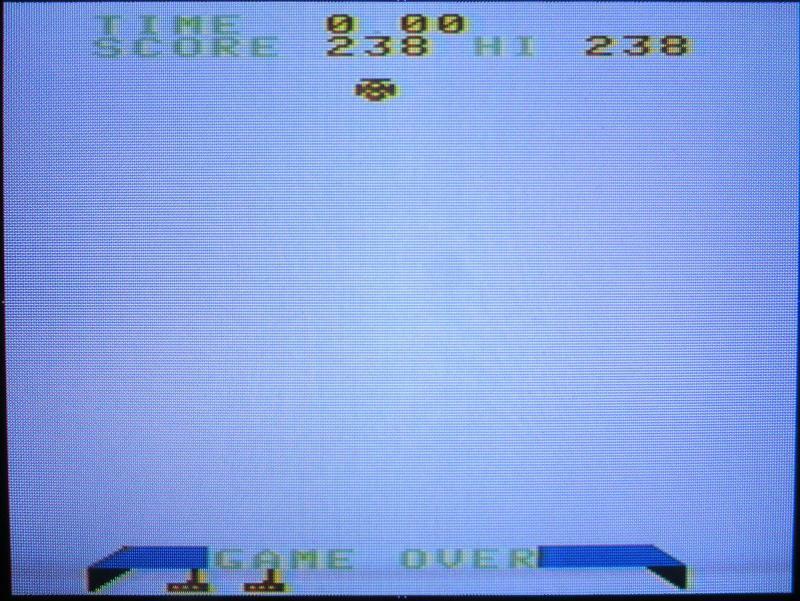 If you wish to erase the HI-score then merely depress the "RESET" button. The high Score will show a blank and your next score will become the Hl-score. Unlike most Arcadia 2001 games, there doesn't seem to be a "freeze" feature in this game. Alien Invaders has no gameplay options. Just start shooting at those terrible attackers. 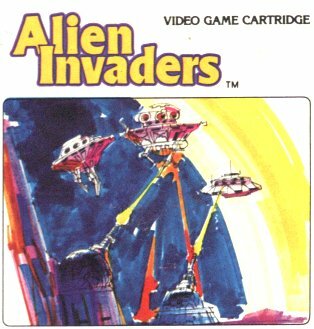 Alien Invaders - Video Review - (2 Points) - I didn't find any reviews of this game. I'd really like to see some quality video that talks about the gameplay. 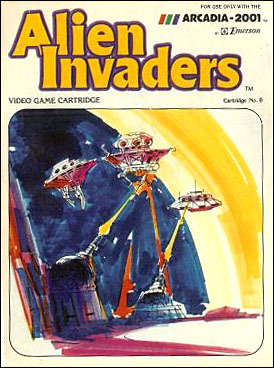 Because of the time it takes to make a "proper" video review, anyone who reviews Alien Invaders will earn two points. 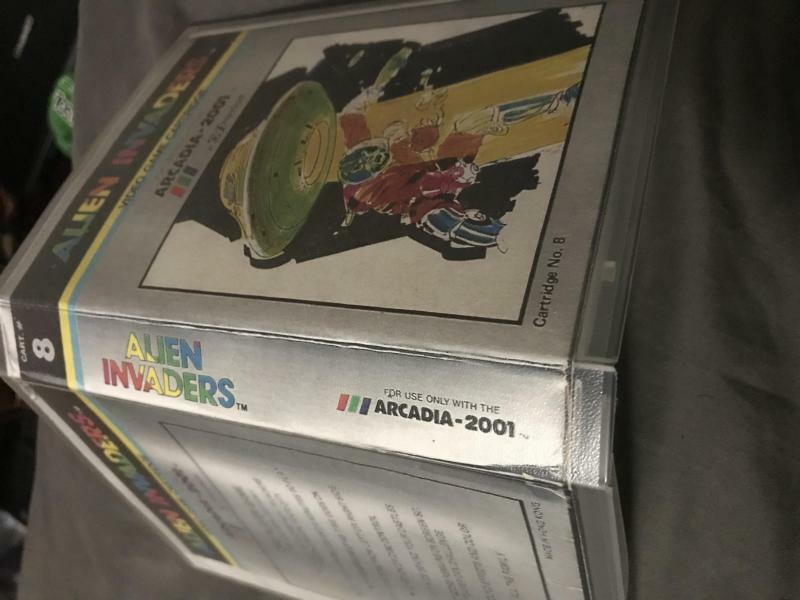 Alien Invaders - Documenting Bugs - (1 Point) - As we've been discovering for ourselves, Arcadia games can be flaky. If anyone finds any problems, and documents them, then they will earn one bonus point. Just in case there are dozens of bugs, you can only earn one bonus point no matter how matter bugs are found. 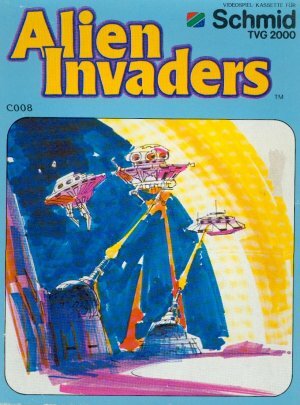 Alien Invaders - Backstory - (1 Point) - Alien Invaders doesn't provide a backstory. I guess one isn't needed for this game, but it might be fun to write one anyway. Write a background that may have been included with the game in 1982 and you'll get a bonus point. Oh, man! Games on the Arcadia family can be so weird. Alien Invaders seems like a test case or demo game for a point-of-sale kiosk. Why would the programmers limit the game to a maximum time of three minutes? There were so many strange choices made for this console. It seems that all or most of the games were made in a rush to get them out to the companies that were selling these games all around the world. According to Ward Shrake, Alien Invaders was manufactured in the first month of 1981. That means it was programmed in mid-to-late 1980. The story behind this "1982" game console is still yet to be written! Who designed the Arcadia 2001 and when was it first created? That's enough thinking about this console's unusual roots. It's time to start playing Alien Invaders. If you've not played in a high score club round before now, then now's the time to join in! Have a fun second round, everyone! The catalog picture is from the tunix home arcade catalog out of new zealand. The line of white box Emerson titles are the pal series Emerson made for the Australian market. It appears the console and all the games except the 4 Bandai exclusives were all made by universal appliances limited in Hong kong. An old company that made cheap appliances, radios etc. It seems totally their baby. Guess they decided to jump into gaming and release a cheap console based on the signetic's chips. I believe the generic home arcade release and that game line was their own and they then let just about anybody they could find distribute it for them. Seems a lot of companies kept the home arcade wording but many also didnt. They then went on to port their most popular games to the 2600 and apparently failed there too. It's unclear if any of those actually ever sold at retail....if so it had to be next to none that made it out the door. In this game, I managed to destroy the wave of invaders with about fifteen or twenty seconds left on the clock (which is probably about ten seconds of real time). Another wave of invaders doesn't appear, but the mothership baddie does reappear again after you shoot it. So, my game ended with me shooting the one baddie on the screen about two or three times in a row. Yawn! One good thing about Alien Invaders is that the games are so short that you can't get hand fatigue from using the Arcadia's hand controllers. This game is frustrating to me. It's so close to actually being a pretty good game, but the problems it has are the absolute worst possible problems a game of this type could possibly have. Chiefly, the time limit and only one wave of invaders. It's so anticlimactic. This isn't the greatest game to play, as it's boring-- but at least it works properly. There don't seem to be any bugs or anything like that. Have fun playing! "I may try to improve on it in a few days as it is not a perfect score by any means. I must admit I am rather fond of this game, maybe that is just nostalgia though!? I think it may have been the pack-in game for the Tempest MPT-03. The "shooting the formations" part is fun, once that is done it gets rather monotonous, it's a bit like Space Vultures in that regard, you only get one screen of fun :-) At least Alien Invaders has the time limit to make it more interesting. "It probably wouldn't be hard to alter Alien Invaders to have multiple levels. "As far as bugs/quirks, there are quite a few that have been known for a long time (eg. wrong castle segments disappearing when shot) but I didn't find any new ones." The war against the Alien menace has waged on for centuries, countless generations have lived and died never knowing peace. Now thousands of light years from earth, one of our colonys has fallen under attack. The Aliens have managed to install a explosive device and theres no way to stop it. But just maybe you can manage to take enough of them with you to help turn the tides! Prepare to avenge yourself pilot! I like that your backstory addresses the silly 5 "minutes" countdown timer. Season 2, Round 2 of the Arcadia 2001/MPT-03 High Score Club ended on Sunday, February 4, 2017 at 10pm MST. Three people played Alien Invaders in this round. That's not many people, but I don't blame anyone who skipped this round-- this game is rather limited. It was cool to see a "homebrew" Alien Invaders backstory; thanks for writing that background! In my "final thoughts" on Space Vultures for the last round, I said, "put plainly, Space Vultures is awful. Terrible. Horrible." I'm not going to say that about Alien Invaders, but it is close. If Alien Invaders didn't have the time limit, then the game would be okay, but the short gameplay time (about three minutes!) makes this a game completely non-noteworthy. Alien Invaders doesn't have any gameplay issues… except that its core mechanic (the time limit) breaks the game considerably. Does it completely break the game? No, but Alien Invaders is about as close to a broken game as you can get without having a completely broken game. Even if only the time limit of this game was removed, then the game would be better. A three minute Space Invaders-style game isn't a bad idea, but it needs to be more manic that the game that is provided here. Thanks for playing in round 2, everyone!